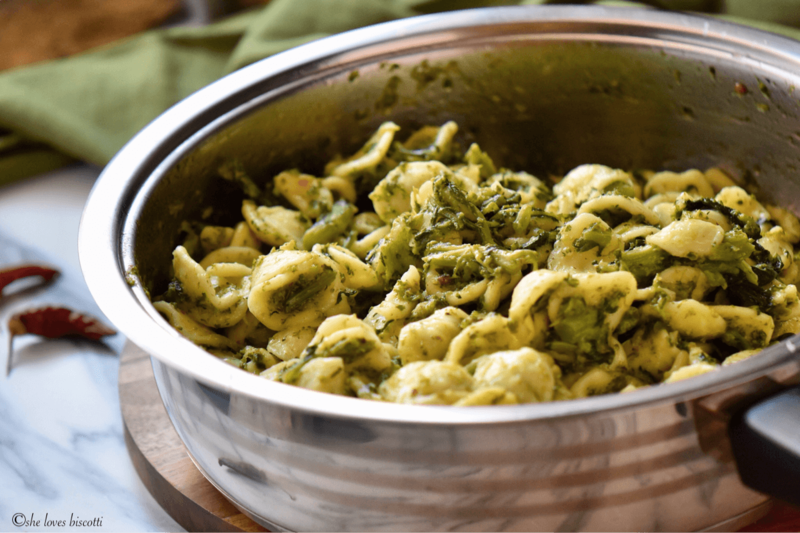 This Italian Broccoli Rabe Orecchiette Pasta Recipe is another example of how simple ingredients can come together in just thirty minutes to create a great weeknight pasta dish. It is well known that Italian cuisine exemplifies regional cooking and traditional Italian pasta dishes are the perfect example. There are literally hundreds of different shapes and each is paired with the perfect sauce. Furthermore, this “perfect” association can be linked to the local ingredients found in particular regions of Italy. There is a pasta shape for every sauce… or is it a sauce for every pasta shape? Regardless, there is a method to this madness and today, all eyes are on this orecchiette pasta. Orecchiette. Little ears. This pasta is immediately recognizable and associated with the Puglia region of Southern Italy, aka, the heel. Unfortunately, this wonderful pasta also has a reputation of sticking together and everyone knows orecchiette are almost impossible to separate once that happens. purchase pasta with little ridges on the exterior… this helps in preventing the orecchiette from nestling together. If you are still having this issue with a particular brand of pasta, I would recommend you switch brands. Just for the record, it has been my experience that fresh orecchiette do not stick together. The little cavity of this orecchiette pasta provides the perfect space to collect just the right amount of sauce contributed by the garlic infused olive oil and the broccoli rabe. I have often wondered if broccoli rabe is an acquired taste. Do you like the bitterness of broccoli rabe? Personally, I love it! Broccoli rabe would often be served during my youth as a simple side or with pasta. If you are interested, you can follow the link for two of my favorite recipes: Italian-style Garlicky Broccoli Rabe and Homemade Italian Broccoli Rabe Cavatelli Pasta. If you do not like the bitterness of broccoli rabe, or if it is out of season, it can easily be replaced with broccolini, swiss chard or even broccoli. That’s what I love about Italian cooking, it is extremely adaptable to personnel preferences… just make sure you start with quality ingredients. As I have previously mentioned, my mom loved to cook. A variation of Puglia’s signature dish would often be made during my youth. My mom would always make this dish with Homemade Italian Sausages. As I recall, one of my mom’s best friend was from Bari, the capital of Puglia. No doubt that is where her inspiration came from. As was mentioned, this traditional dish has its origins in the beautiful Puglia region of Italy. It is referred to as Orecchiette con le cime di rapa and usually includes a topping of toasted bread. Feel free to adapt it to your own personnel preferences. 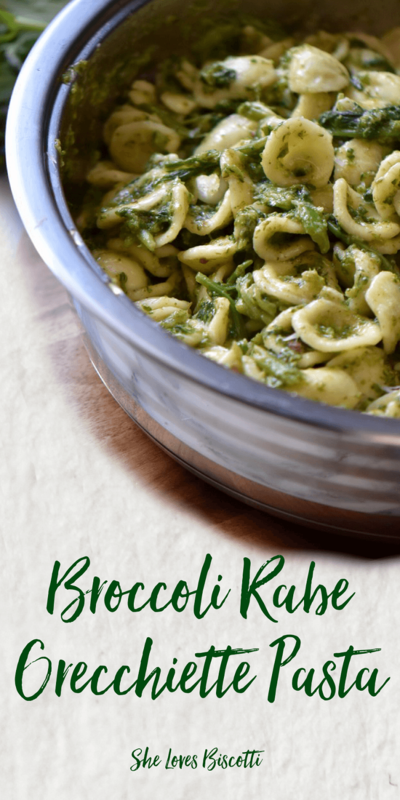 Here is my mom’s version of this Italian Broccoli Rabe Orecchiette Pasta Recipe which we still enjoy to this day. This Italian Broccoli Rabe Orecchiette Pasta Recipe is another example of how simple ingredients come together perfectly to create a great pasta dish. Drain broccoli rabe in a sieve. Gently squeeze out excess moisture. Coarsely chop and set aside. Bring large pot of salted water to a rolling boil. Please note that you can use the same water to cook your pasta. My personnel preference is to start with a fresh pot of water. Add the pasta and stir. Cook pasta according to package directions or until al dente. While the pasta is cooking, heat the oil in a large frying pan over medium low heat. Add the garlic and anchovy fillets. Mash the anchovy with the back of a spoon for about 1-2 minutes. If using, add red pepper flakes and stir for 30-60 seconds. Add the cooked broccoli rabe and stir to combine. Adjust seasonings and heat through. Set aside and keep warm. When pasta is done, drain, reserving 2-3 ladles of the pasta water. Return pasta to the pot; add the broccoli rabe mixture and some pasta water to adjust the consistency. Add the cheeses and toss together. Plate pasta and garnish with more grated cheese. LOVE THIS POST? PIN IT TO YOUR PASTA BOARD! Maria, your family recipe is very similar to ours. I think that broccoli rabe is an acquired taste for some people, for us it is just part of our childhoods. One of my all time favorite dishes! Have I told you how much I love you and your recipes?! Cause I do, and this is another one to add to the list of must-try’s. I love broccoli rabe (first time I ever had it was actually on pizza). I think I’ll pick some up next time im at the store and give this a try. I don’t think I’ve ever cooked orechiette but this looks delicious! I love the added anchovy too, what a burst of flavour! Mmm, so many of my favourite things in this dish! I love an easy pasta dish recipe for the cooler months, looking forward to trying this out! Great Jessica! I am sure you are going to love it 🙂 Thanks for stopping by! We’ve eaten this dish so many times in Italy with my family and many more here in Canada with Loreto. We, as you, love the bitterness of the broccoli rabe and paired with the orecchiette it is a pasta dish we can’t say no to. I’ve never had it with anchovies, though, but I believe it gives a nice kick of flavor. I never had any problems with orecchiette sticking together, and I, like you, say: buy good quality ingredients and products!